Sprawling along the eastern shore of the Inner Sea lies Qadira, one of the mightiest nations of the region. Itself merely the westernmost tip of the vast Padishah Empire of Kelesh, Qadira has long stood as a bastion of culture and faith for humanity. Great dangers and wondrous opportunities for adventure await within this storied land - those who visit Qadira are well advised to prepare for their journey! Comprehensive information about the history of the mighty nation of Qadira, its people, their customs, and their faiths. A first look at many elements of the Padishah Empire of Kelsh, including new societies, new faiths, and new organizations from that ancient region. A full map of the nation of Qadira that covers both its civilized regions and its wilderness, revealing never-before-detailed jungles, strange new sites in which to adventure, and the full expanse of the land's beautiful but deadly deserts. A detailed and robust system for finding patrons and working with Qadira's movers and shakers among the nobility and powerful merchant families. Several new monsters, including genie-touched horses, along with a wide range of new player options for characters from Qadira, including archetypes, feats, magic, traits, and much more! 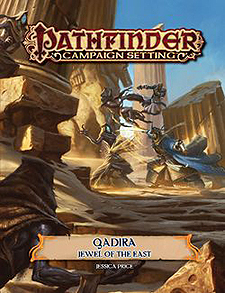 Pathfinder Campaign Setting: Qadira, Jewel of the East is intended for use with the Pathfinder campaign setting, but can be easily adapted to any fantasy world.